Why does cold weather make me crave heavy food? Don’t like your veggies? Blame your genes. The Carolina Reaper, the Guinness Book of World Records’ hottest pepper, recently got its five minutes of fame. Two young women posted a video in late August of their reactions after taking a bite of the Reaper. Several seconds of moderate complaints, spitting and hand flapping preceded screams, makeup-smearing tears, and even vomit. One of the women had to use an inhaler to help her breathe. The video currently has 8.5 million views. At the Guinness Book of World Records website, some commenters sound much more relaxed about the Carolina Reaper pepper, a hybrid of a ghost pepper and a red habanero. “I ate 6 of them at one time,” posted Anina Skeel Holbek Thomsen. 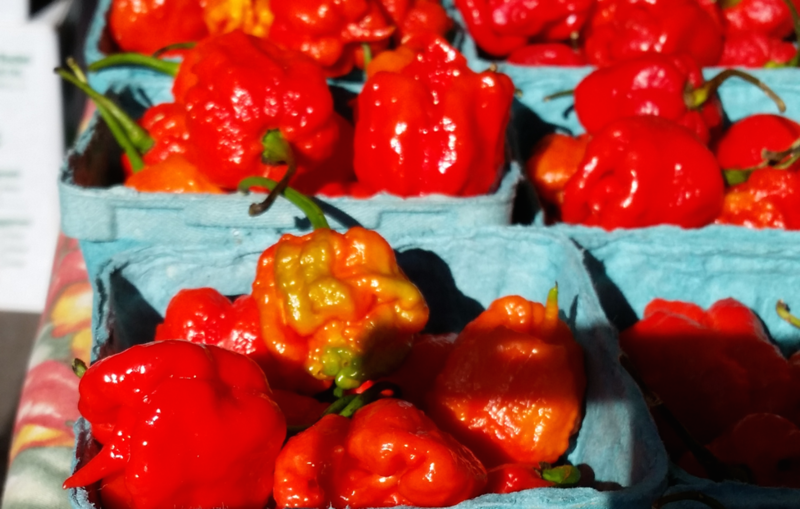 And earlier this year, Wayne Algenio ably downed 22 Carolina Reapers in 60 seconds, setting his own world record. Rated at more than 1.5 million Scoville heat units (SHU), the accepted scale for pungency or spicy heat, the Reaper falls right below the pepper spray police use for crowd control, which is 2-5.3 million SHU. How well people can tolerate the Reaper’s spiciness varies widely. Why do some pepper eaters calmly bear the sensation whereas others react so dramatically after a single bite? The spicy-hot story starts before we are born. Some people inherit fewer of the capsaicin-detecting receptors that typically line your mouth and throat, making them less sensative to the irritating compound in spicy foods. When binding with capsaicin, these receptors send “Hot! Hot!” signals to the brain via the trigeminal and vagus nerves. The receptors also exist in other mucous membranes, such as the eye, and send similar signals that make your eyes water when you eat something spicy. A woman in India, Anandita Dutta Tamuli, may be an example of the lucky few who have no such receptors. When Tamuli squeezed the juice of a 1-million-SHU pepper into her eye in 2009, she had almost no reaction. “So you have to say she was born with no capsaicin receptor,” says food historian Dave DeWitt, who has written many books on chili peppers. Tamuli is not alone. A study of twins by researchers at the University of Helsinki revealed that 18 to 58 percent of the pungency sensation can be explained genetically. Genetics also can determine variations in the number of taste buds and associated nerve fibers in your mouth. But Prescott also suggests one can develop a taste for spicy foods through cultural or social influences, regardless of genetic inheritance. In India, for instance, some mothers put a tiny bit of chili on their babies’ lips to help them become accustomed to the sensation, says Prescott. In Mexico, a family typically adds chili to the food at the table, so a child growing up in such a family may develop that flavor preference. In Australia and the U.S., spicy food typically is not a natural part of what people eat every day, says Prescott. Yet as teenagers we may learn to associate the pain and eye-watering experience of eating spicy food with having fun with friends, he says, so a social influence is at play. Dewitt lives in Albuquerque, New Mexico, where people eat spicy foods every day. Nonetheless, he carries a small cylinder with pepper powder on his key chain. It comes in handy when he travels to places that serve bland food. “In that cylinder — I guess many people keep cocaine — I have superhot chili powder,” DeWitt says. Endorphins are also a natural pain reliever. So endorphins could contribute to pepper tolerance by blocking the hot sensation, explains Paul Bosland, a horticulture professor at New Mexico University and director of the Chile Pepper Institute. In one New Mexico-based study, students were fed jalapeno peppers. Once the students’ pain faded post-consumption, scientists injected them with an endorphin blocker. The unpleasant sensation resumed, suggesting that endorphins had blocked the sensation, Bosland says. Cici Zhang grew up in China and studied neuroscience at Swarthmore College and (for her M.S.) Washington University. While she came to America for endless possibilities, she’s still surprised her blogging could start a journey towards being a science journalist in NYC. Combining meeting people, traveling and her love for science and words, this career seems like a dream in reality. Cici enjoys Instagram, movies and beautiful things that satisfy her curiosity. You can follow Cici on Twitter here. Someone beat Wayne Algenio’s world record on November 13th of this year. Perhaps a visit to Guinness World Records website would help. Yeah, I’m one of those people that just keeps going further and further until I disappoint myself with how underwhelming spicy foods have become. Tread lightly if you want to enjoy it more frequently. That pure capsaisin stuff I bought, though great at the time of eating it… Well, it has desensitized me more than the Carolina Reaper does, and as a result the Reaper doesn’t give me that burn like I wish it did. I have memories of having the reactions to spice that I read about here and now I cheer whenever it happens, and it’s usually by complete accident because most of the time I feel little to no heat. My son is one of those born without the receptors. He has eaten the hottest wings from Buffalo Wild Wings and a Carolina Reaper with no reaction. It was like he was eating vanilla ice cream. We were recently playing with pepper spray I bought my daughter (it went through the wash twice and we decided to test it and see if it still works). He had no reaction to that either, and that’s pure capsaicin!